When Ai Miyazato entered the press room ahead of the Women’s British Open at Royal Lythm and St. Annes there was a frenzy of activity from Japanese cameramen and journalists. Stand-in LPGA commissioner Martha Evans has a tough job on her hands. It was an exciting sight and was certainly inspired by her win at the Evian Masters the previous week. But shortly after, when world number one Lorena Ochoa entered the room to give her story in the build up to the last major championship of the year, there was hardly anyone in the room. I couldn’t believe that a player of such caliber could draw so little attention – there were only 10 or 12 journalists in the room and it was a press conference before a major championship! It lasted 10 minutes. It is hard for me not to compare that to when Tiger Woods walks in the room, especially before a major championship, people are hanging from the rafters to make sure they don’t miss a moment of the press conference, which is an event in itself. I thought that sadly the lack of attention to Ochoa was a reflection of the state of the women’s game and the general lack of interest from the press and public. 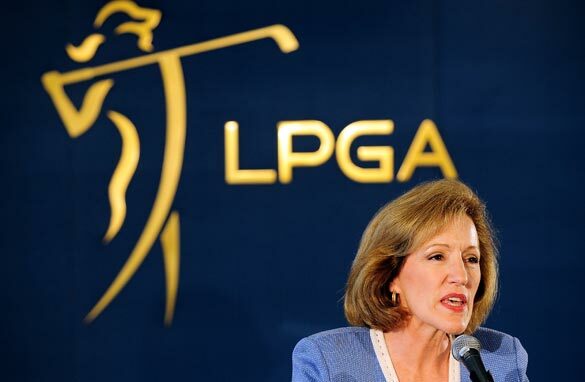 The LPGA has lost 7 tournaments since 2007, its last commissioner resigned a few weeks ago after a stint that came with plenty of controversy and sponsors are heading for the door. Before Carolyn Bivens resigned as commissioner she tried to introduce a policy that all Asian players should learn to speak English before being allowed their LPGA player’s card. The suggestion went down as more laughable than a duffer’s air swing in a pro am and given that Asian players have won 9 times on the LPGA tour this year perhaps the field should be learning to speak either Korean or Japanese if anything. If it wasn’t for Asian players like Miyazato bringing something to the women’s game in the U.S. and helping with exposure in the Far East then it would be in a tragic state. I spoke with stand-in LPGA commissioner Martha Evans before the British Open about the state of the LPGA. She put on a brave face saying that it was tough times for all sports when it came to attracting sponsorship. Evans is a former Rear Admiral in the US Navy so she is used to sailing through stormy waters and at this moment she is the captain of a very leaky boat and I hope she has a few ideas in mind to stop it hitting rock bottom. I think it is time to recognize that asian lady golfers are on the rise, most notably the Koreans and Japanese. Where are all the Korean men at?